I hope you enjoyed all the projects yesterday! 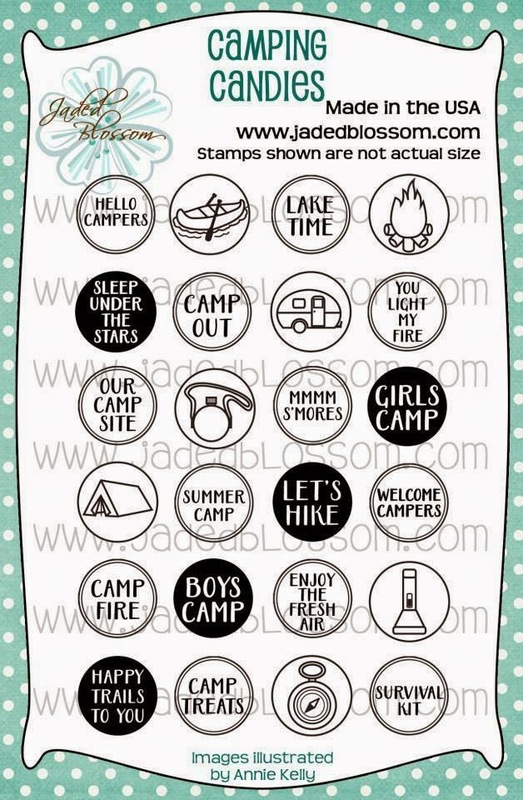 I just love all the fun stamps and dies in this release and hope you do to!! 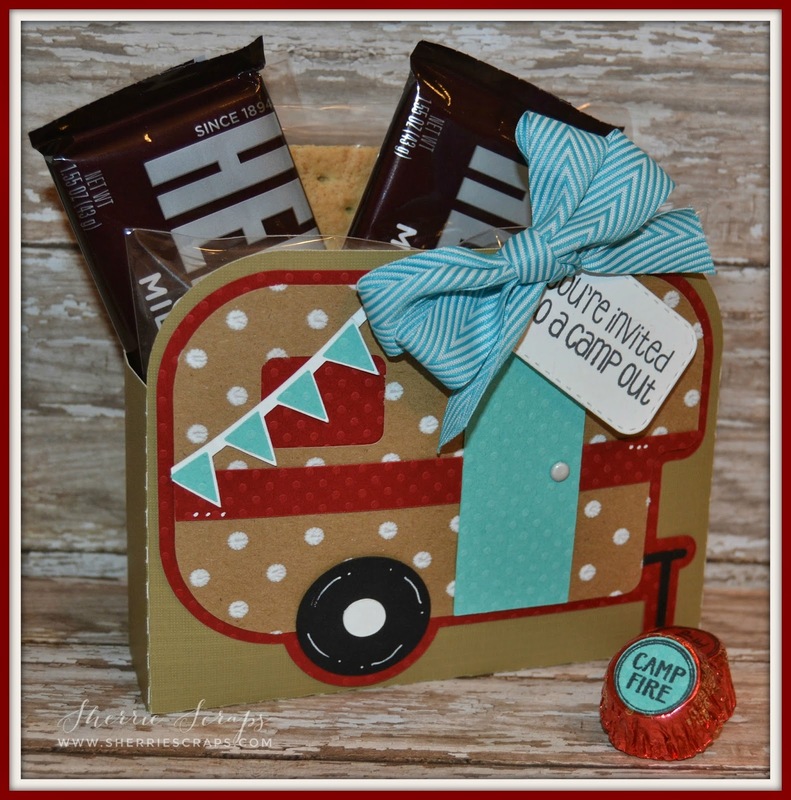 I found this cute camper treat box file from the Silhouette Store #62402 and thought it would be so fun to make it :) This would be so fun set to give to someone taking off for a summer vacation, summer camp, camping get together...etc. I also have a matching card from the Silhouette store # 59698. 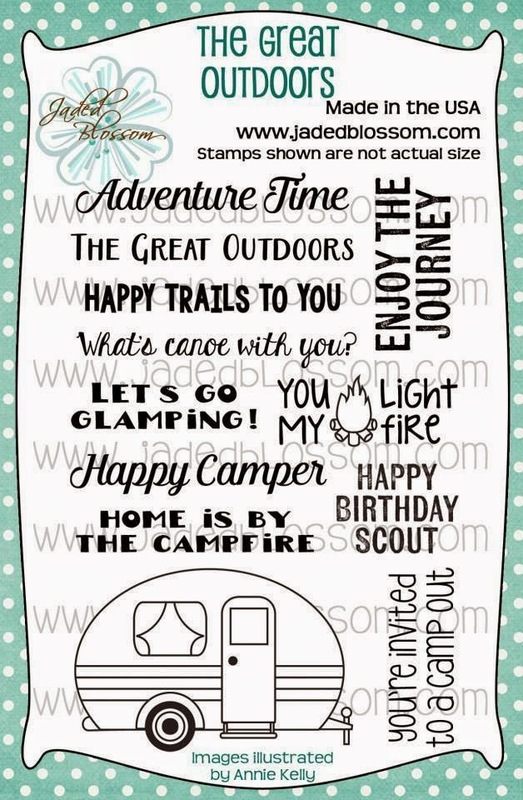 The sentiment is stamped with the Great Outdoors stamp set. I filled this clear box with my favorite...yummy recess peanut butter cups. I decorated them with the Camping Candies and tied on some burlap ribbon......such a fun set! Here is another quick project~a fun backpack that I found at the Silhouette Store #46176. I added some fun crinkle ribbon for the straps on the back. 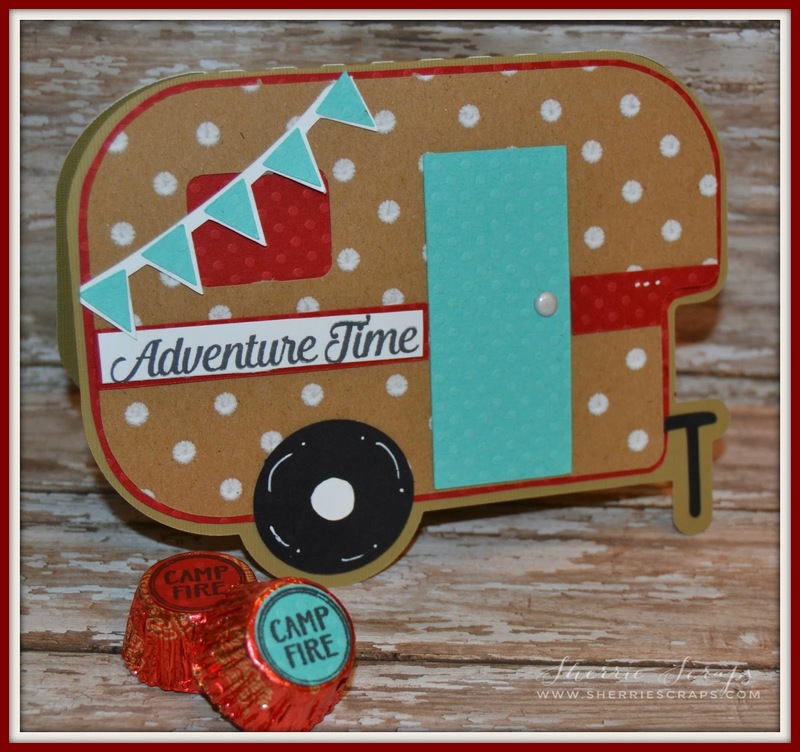 The tag is from the Mini Tags Die 2 and the sentiment is stamped with the Camping Outdoors stamp set. The little treat is filled with yummy chocolates and decorated with fun images using the Camping Candies. That's it for today~hope you liked my project :) Be sure to stop over at Jaded Blossom to check out the inspiration from the Design Team for today. I will be back tomorrow with another fun project to share! These are all AWESOME Sherrie!!!! What an AMAZING showcase of the new stamps!!! LOVING all of today's projects!!!!! These are both awesome! You make the BESTEST gift sets!! I am LOVING that camper!!!!!!!!!!!!!!! This is fantastic Sherrie! LOVE the color scheme and that fun backpack too! Both are fantastic. 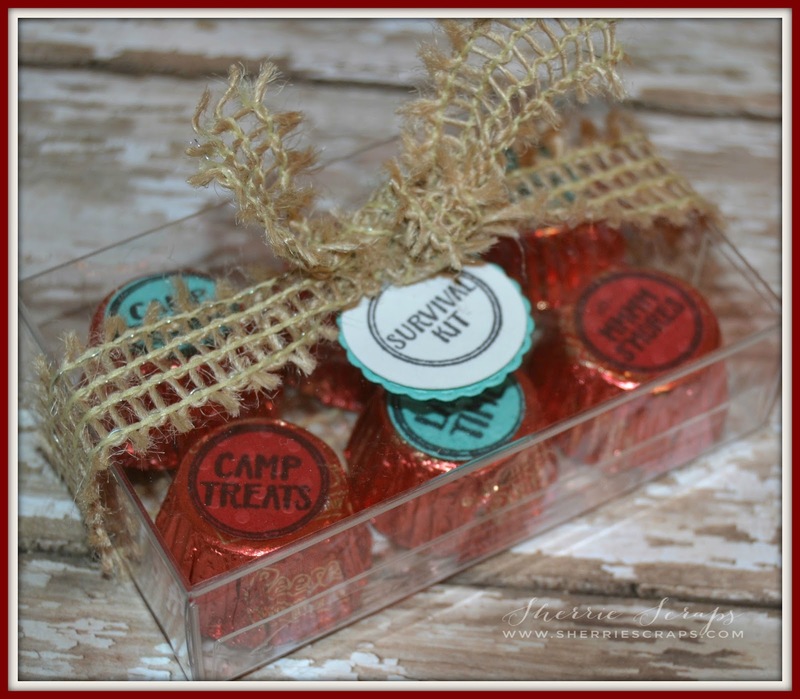 I so love the camper treat box. Filled with all that Yummy candy would make a great treat for anyone. 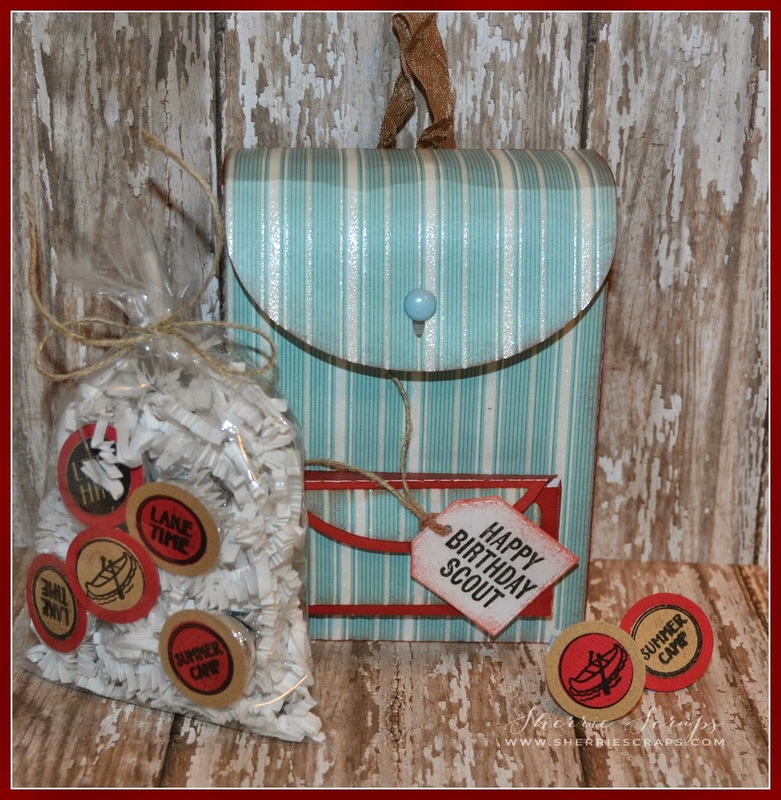 Awesome camper gift set, so super fun and creative! I also love the backpack you created! Great job on your guest designer spot this week, have a fabulous day! 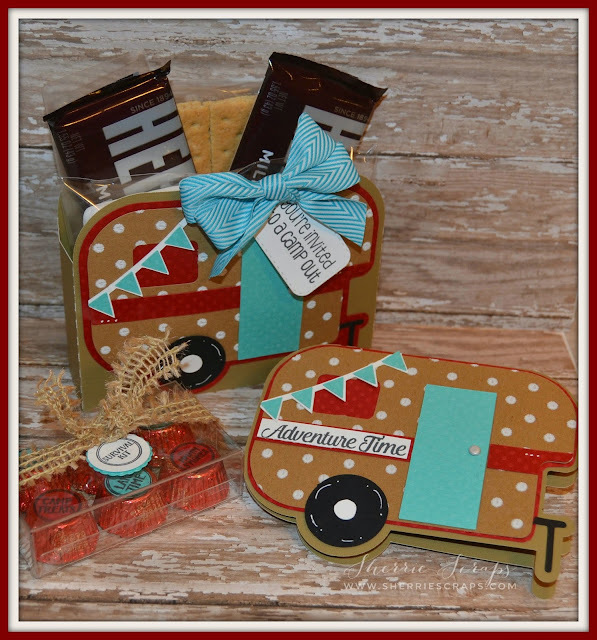 Love, love, love this fun camper set! What great projects you've created with this set (I LOVE the color combo)! You have showcased this set wonderfully, everything looks fabulous! these are both tooo cute ! love the color combo you used !! very very cute !!! Such an adorable set! Love this Sherrie! Hi Sherrie, these are super cute cute! I hope you are well. Sherrie I just love, love, love this camper! It brings me back to the 70's... so stinking cute and retro! I love how you dress up candies and treats, you make them look too pretty to eat!!!! Super cute projects my friend! These are AMAZING!!! You are absolutely rocking your designer spot!! Such fabulous creations! Another absolute CUTIE! you knocked this one right out of the park! I love this retro camper...SUPER cute! These are AWESOME !!!!!!!!!!!!! Sherrie I love these !!!!!!!! You showcased everything absolutely perfectly !!! Congrats to you on your GDS over at JB!! Woohoo!! This is so STINKIN cute!This is so COOL or little campers.And let's not forget the ADORABLE backpack..MY FAVORITE!! TOO darn cute!! LOVE LOVE these!! The color combo is awesome and WOW that backpack is freaking cute!! Great color combo! I love these! OMGOSH! Look at all these AMAZING creations! How FUN will this be for the Summer and camping trips! Even if you aren't the one going ~ to give these to others for their adventure ~ WOW ~ AWESOME idea! Of course every single detail is AMAZING!! LOVE the color combo too! AWESOME job!